The brown LOWA Z8S GTX® (Z series) of military boots builds on the success of the highly rated LOWA Zephyr as a tactical lightweight military boot. LOWA decided to develop a more stable and more supportive boot after receiving requests from military, SF and Law enforcement personnel. Operators needed a boot that sat between the traditional Combat boot and multi-functional military boots (like the LOWA Zephyr). Military personnel needed a ‘hybrid’ boot capable of a number of different tasks and functions. The target was to have a lightweight boot that still retained stability and the walking characteristics of a lightweight hiking boot but offered users the support and protection found in a tactical boot. The innovative GORETEX® Performance Comfort Footwear lining provides extended comfort in warmer conditions. Technology that includes: hydrophobic suede leather, highly abrasion resistant laces, a patented Monowrap® midsole and LOWA Fusion® technology, EVA Polyethylene rubber and LOWA’s own ‘Cross Duty’ all combine with a unique Fast Rope insert to give todays operators a truly multi-functional boot. 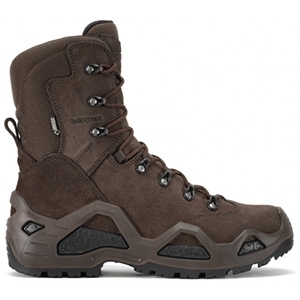 The brown LOWA Z8S GORE-TEX® boots are a more supportive ‘brother’ model to the LOWA Zephyr.